With the upcoming holiday season, I know we are all out there busy shopping for the perfect, to-die-for gifts for our loved ones. This week, I will have a few more ideas for you, but one of them deserved a write-up all it’s own: TasteBook. This is, hands-down, one of my favorite gifts I have ever given to anyone. My parents are both avid home cooks, and have random collections of their favorite recipes stored everywhere -- in binders, baskets, cookbooks, handwritten on cards, and sometimes, existing just in their own heads. I saw an opportunity to not only collect together all of our favs into one gorgeously-bound book, but to create a lasting memory of our family’s food history. You may have heard of this build-your-own cookbook site before, but have you ever poked through and looked at the capabilities? It is simply amazing what you can do. Even better, it’s DIY, but then they do half of the actual work for you, printing and binding the masterpiece together. This is Dad’s book cover. You can add whatever title you want, and they provide great full-color pictures to use as the background. I chose the manly meat cover for his. Mom got a festive holiday table spread. Inside, the book comes with pre-set full-color tabs, and then you create the individual pages! I (stealthily) pulled together the recipes I wanted to include for each of their books, then typed them into Word so that I could spell-check before pasting them into the templates online. 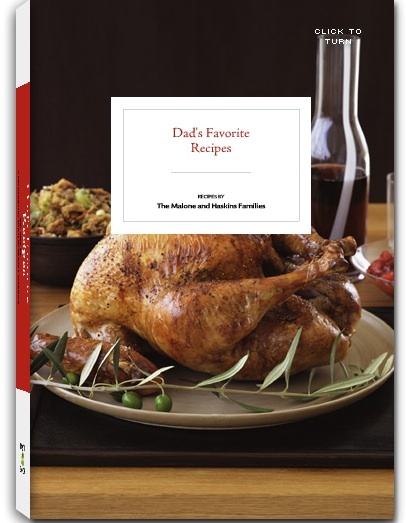 All of the recipes you enter are stored on your account, so you can always go back and reference them on your own. What I love about TasteBook is that you don’t have to make it a book full of family recipes if you don’t want, or if you simply don’t have the time to compile everything. TasteBook offers a partnership with over 40 publications, including Cooking Light and Gourmet, and you can search for recipes in a huge database. One click and voila! The recipe is added to your book. TasteBook also offers a huge set of pre-made inspiration cookbooks for purchase with recipes from those same publications, such as A Home Cooked Holiday. Once your TasteBook is made and delivered, sit back and never worry again that Great-Grandma’s chicken soup recipe might get lost between the cracks. 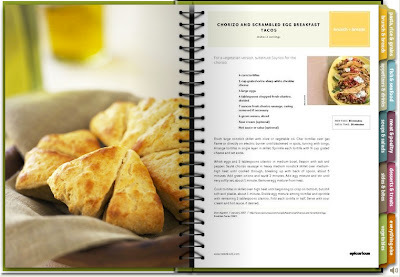 And if a new family favorite is discovered, each TasteBook comes with credits to create additional recipe pages later that just snap into place. Speaking of, I have an outstanding “gift” to my Mom from her birthday to do just that ;) Better get typing!! Happy Cooking, everyone. And heads up -- if you purchase three books before December 8, they are offering free shipping!